Many believe the phrase “God is one” means God is only one being. Is this true? How are God the Father and God the Son one? What does the Bible reveal? Most who profess to be Christians know that Christianity is considered a monotheistic religion (believing in only one God), and they also know that almost all churches teach the Trinity. But most people cannot explain how a Trinity of three divine “persons” makes one Godhead. Even more important, most don’t understand what the Bible teaches on this subject. Churches and religions have different ways of explaining the oneness of God. Unitarians/Universalists see God as one being (but not in three “persons”). Judaism likewise does not allow for a plurality of beings in the Godhead. Interestingly, the Old Testament refers to God in a plural sense but also in a singular sense. The divinity and preexistence of Jesus Christ relate significantly to the concept of the oneness of God. However, this article will focus directly, from a biblical point of view, on the oneness of God. How is God one? We believe the Bible teaches that there are two individual divine beings in the Godhead, yet They are of one Spirit and completely unified in mind and purpose (John 1:1; 10:30; Ephesians 4:4-6). Early in the book of Genesis, we find an amazing statement in this regard: “Then God said, ‘Let Us make man in Our image, according to Our likeness’” (Genesis 1:26). The Hebrew word for God here is Elohim, the plural of Eloah. It should be noted that this term can also refer to pagan gods, human rulers or judges, and angels. But in the context of Genesis 1 it clearly refers to the true God. And though Elohim is sometimes used in a singular sense, this is not the case in Genesis 1:26, as we can see from the plural pronouns used with it. Some try to explain the plural “Us” and “Our” as including angels. But that cannot be so because humans are not made in the image of angels, some of which have four faces and wings (Ezekiel 1:5-10). 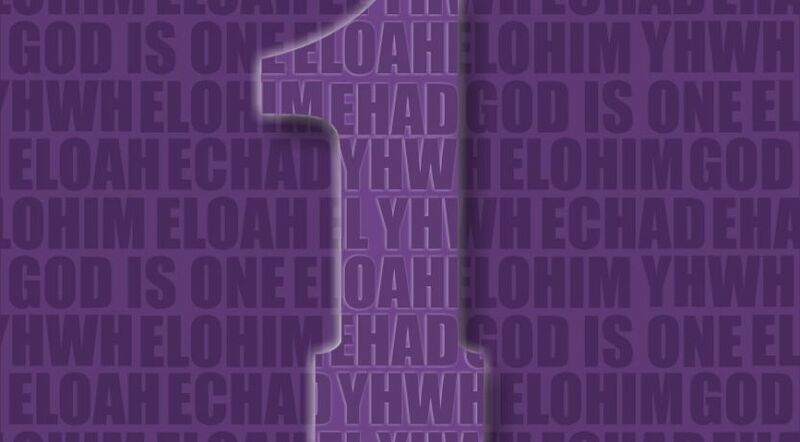 The English word God in Genesis 1:1 is also translated from the Hebrew word Elohim. Then in Genesis 11:7 we find the plural pronoun “Us” used to refer to the antecedent LORD (translated from the Hebrew word YHWH—the Eternal) in verse 6. So, from the beginning, we see the Bible hinting at a plurality—an “Us” and “Our”—within the Godhead. Now we’ll look at a few of the primary scriptures that may initially seem like they are saying God is only one being. The Jews call Deuteronomy 6:4-6 the Shema, the noun form of the verb shama, meaning “hear” or “listen (with full attention and obedience)” (Spiros Zodhiates, The Complete Word Study Old Testament). Shama is the first word of the passage. These verses form the centerpiece of the Jewish religion, expressing their belief in the absolute unity of God. As a liturgical prayer, the passage is recited twice daily in many synagogues. The passage reads, “Hear, O Israel: The LORD our God, the LORD is one! You shall love the LORD your God with all your heart, with all your soul, and with all your strength. And these words which I command you today shall be in your heart” (emphasis added throughout). Research shows this is not necessarily saying God is only one being. The word one comes from the Hebrew word echad or ehad. It can mean “compound unity, one made up of others” (Bullinger’s Companion Bible, comments on Deuteronomy 6:4). Mounce’s Complete Expository Dictionary of Old and New Testament Words gives the definition “one, first, other.” Then it states, “‘One’ can be the first of a series (as in day one of a week or month) or it can indicate one person or thing singled out from a group (‘one of the men,’ Genesis 26:10; ‘one of the mountains,’ 22:2.’” Later in the comments it says: “Ehad does not signify isolation or aloneness.” Many other verses use echad in the same way. One of the best examples to help understand that echad―oneness―can refer to more than one being or member is found in Genesis 2:24, “Therefore a man shall leave his father and mother and be joined to his wife, and they shall become one [echad] flesh.” The marriage of husband and wife produces a union called one flesh. This one flesh (one marital unit) is composed of two individuals. If God wanted to emphasize that there is no other being called God, another Hebrew word would have been more appropriate to use. The Hebrew word yachid or yacheed does signify absolute unity or uniqueness, as in “only one.” However, God did not inspire yachid to be used in the Shema. Interestingly, the word for God in this passage is the same plural word discussed earlier—Elohim. If God were only one being, it would be confusing to use this plural word when trying to establish the doctrine that God is a single individual. These fit very well with the context of the chapter, such as verses 12-15, which warn against worshipping other “gods” and emphasize worshipping only the true God. We are to put God first (one of the definitions of echad). There are those who claim the information cited above supports trinitarianism. Not so. Trinitarians claim God is three distinct “persons,” including the Holy Spirit, but that by a supernatural mystery God is one being. The Trinity is not taught in the Bible, and echad does not require that we understand the word one in that way. Echad can delineate more than one being in Elohim (the Godhead or God family) just as there is more than one individual in a marriage. The Hebrew word translated God in this verse is Elohim, the plural form discussed earlier. Again, this passage is pointing people to the worship of the true Creator and not false gods―which really aren’t gods. We know God Most High and the Word (Jesus Christ) worked together on the creation (John 1:1-3; Ephesians 3:9). These verses obviously and clearly refer to Jesus Christ as well, a second being with the Father. It’s interesting to note that the One who worked with ancient Israel was the One who became Jesus Christ (1 Corinthians 10:4). Please see our article “Jesus Christ Was the God of the Old Testament” for more information. So the Father and the Son are both God. This is a family relationship, so we could say that God is Their family name. They are both members of the one God family. Also note that the Creator in this section of Isaiah addresses Jacob in the singular (Isaiah 43:1, 22; 44:1; etc.). But Jacob consists of 12 tribes and multiple millions of individuals! The thrust of these chapters deals with worshipping the true God instead of idols—not with the number of beings in the Godhead. The apostle John gives deeper understanding of how God is one. He wrote, “In the beginning was the Word, and the Word was with God, and the Word was God” (John 1:1). A few verses later John explains who these two beings are and describes Their relationship: “And the Word became flesh and dwelt among us, and we beheld His glory, the glory as of the only begotten of the Father, full of grace and truth” (verse 14). Verses 29 and 34 show that the Word became Jesus, who is the Son of God. So the Father and the Son are both God. This is a family relationship, so we could say that God is Their family name. They are both members of the one God family. The Greek word translated “only begotten” in verse 14 helps establish this understanding that God is a family. “The word monogenees actually is a compound of the word monos, ‘alone,’ and the word genos, ‘race, stock, family.’ Here we are told that He who came to reveal God—Jesus Christ—is of the same family, of the same stock, of the same race as God. … There is ample evidence in the Scriptures that the Godhead is a family” (Spiros Zodhiates, Was Christ God? : A Defense of the Deity of Christ, 1966, p. 21). John 17 also discusses the true oneness in God as perfect unity, a unity true Christians (who John calls “children of God,” 1 John 3:1) are to be a part of. We are to have the mind of Christ—to allow Jesus Christ to live in us (Philippians 2:5; Galatians 2:20).